The Holiday Shops have returned to the park for the 2011 Season. The Shops truly have something for everyone from gifts and games, to snacks and jewelry. A lot of familiar faces have returned to the park again this year like Max Brenner, Bearhands & Buddies, and Metal Park. But we have some exciting new additions as well. Don't miss Troll Beads, Pickle Me Pete, Potterylady, and Handsome Howard. 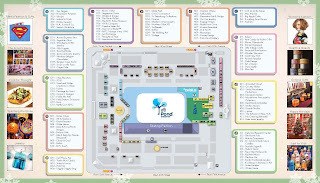 Take a moment to peruse the brochure (click image above to view PDF) for the full list of 2011 Holiday Shop Vendors or take your time wandering through the park, getting lost in the treasure trove of gifts. Brochures will also be available in the park in the coming week, or you can use the interactive guide on the official Holiday Shops website.